Want to connect with Filippo? 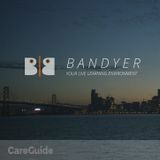 Bandyer is a robust learning environment created for learners and teachers/tutors to connect in real time. People can easily gain the skills they need, from academic to creative, any anywhere in between. Bandyer provides all the necessary tools for a lesson such as SCREEN SHARING, FILE SHARING, COLLABORATIVE WHITEBOARD, CHAT, AND YOUR CHOICE OF AUDIO/VIDEO INPUT. You can schedule your session with a tutor or a student when convenient to you using the CALENDAR. Teachers set their own rate and payment is guaranteed. Bandyer handles the payment for you and charges teachers only 5% on every session. It has a deep understanding of each lesson flow which allows the learners to pay teachers for the effective time they’re connected. For the initial 5 minutes of each session the learner and the teacher are allowed to leave without any charge. This way you have the control to ensure your teacher and student is right for you. Current Psychology major, Chemistry minor student at the University of Illinois, Urbana-Champaign.